• Triband wireless base station, different from the current use of the Internet connection mode, the company uses beam forming to connect, and a 360-degree coverage, coverage is excellent, and the vendor has 24 customers AP links, relatively easy to manage. • The product can be applied to 5G wireless communications and carries out security monitoring and traffic control in smart cities. • Advanced network monitoring support and management through cloud management are advanced and innovative; at the same time, it is easy to operate. 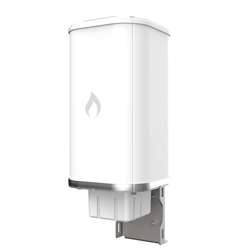 • World's first cost-effective Tri-band (60GHz + 5GHz+ 2.4GHz) 360˚ coverage base station, 24 client AP connection support. • High performance, unlicensed band , interference-free up to 10Gbps. • Quick, easy & reliable link alignment, setup and planning. • Ideal for 5G fixed wireless, smart city application for last-mile or mobile/security control/traffic control backhaul.